Huang "Maple" Yi-Tang and Hu "SwordArt" Shuo-Chieh have​ joined Suning Gaming, departing the League of Legends Master Series for the first time in either player's career and moving to the League of Legends Pro League. The two players leave behind Flash Wolves after a pair of extended stays on what is widely regarded as the most dominant ​League of Legends team in the LMS. Both joined yoe Flash Wolves in October 2013 — Maple as mid laner and SwordArt as support — and remained there for the next five years. The two players ​left the team Nov. 11 alongside teammates Kim "Moojin" Moo-jin and Yu "MMD" Li-Hung. Suning Gaming is one of the youngest teams in the LPL, having competed in just three splits of the league. The team has performed well in those splits, earning top five finishes in each one. It has yet to make an appearance at the League of Legends World Championship. 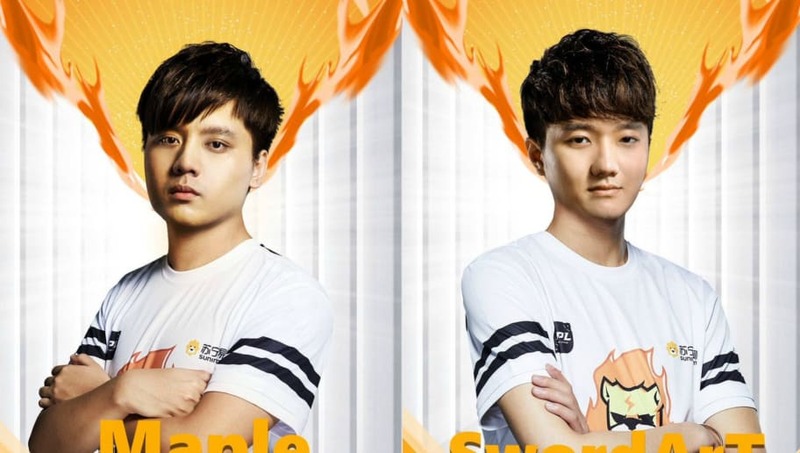 Maple and SwordArt are the first Taiwanese players to join Suning Gaming in its history.